We’ve gotten some absolutely fabulous new pieces of fine horse jewelry in lately. 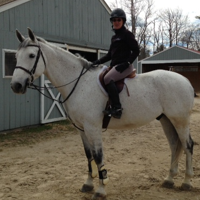 If you haven’t browsed the collection yet, I urge you to go here and see all the great new gold horse jewelry, silver horse jewelry, and, especially exciting this spring, pearl horse jewelry. 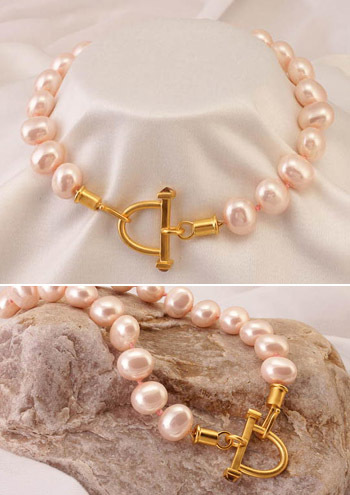 For example, check out this fabulous large Pink Pearl Neckpiece with a Gold Horse Bit Closure. This is such a quintessential spring piece. Bold, round shapes are huge this season, and the 18mm pink pebble pearls used in this necklace are exactly on point. The color is soft and classic; it pairs well with navy and charcoal as well as the softer tones in your wardrobe. Another piece of pearl horse jewelry we really love is this gray pearl necklace with an antique horse fob. It’s an elegant piece of fine horse jewelry; grey freshwater pearls are partnered with a sterling silver fob cast from an antique English mold. The fob features a rearing horse. You can get this necklace in either a 16″ or 18″ length. Always stylish, you’ll treasure this pearl horse necklace for years. One of the things we hear people say about pearl horse jewelry is that they love it, but that it’s just too special and delicate to wear every day. Here’s the answer to that concern: the freshwater pearl necklace with sterling silver horseshoe disc. It’s cute, it’s charming, it has the special elegance and style that only pearls can give, and you can wear it everyday. Casual style for the horse lover! What’s neat about this necklace is that the horseshoe disc comes on and off easily -you can wear the necklace with or without it for maximum versatility. It’s adjustable, too – enjoy it at the 16″ length or extend it to 18″.